Red, White and Good for You, Too? Break out the sparklers, and red, white and blue gear, the Fourth of July holiday is almost here! If you’ve ever wondered why these colors are synonymous with the American flag and Independence Day, check out this article – it’s fascinating information. We’re here to talk about some fun Fourth of July food that is not only red, white and blue – but good for you, too! There’s no doubt that you’ll have your fair share of celebratory events to pick from this July Fourth, like picnics, sporting events, fairs and barbeques. Each of these awesome events feature friends, fun, and most importantly, food. Traditional Fourth of July food includes burgers, hot dogs, potato salad and brownies. Although these food items are staples at the table, they’re not necessarily the most healthful choices. These foods can be energy dense and nutrient poor, which means they’re high in calories and low in healthy items like fiber, vitamins and minerals (like those that contribute to proper vision for watching fireworks – such as vitamin A). There’s an easy way to enhance your Fourth of July feasting – while still staying true to red, white and blue. Typically, the reds, whites and blues found in our diet come from the fruits and vegetables bearing pigments, made of molecules, that reflect and absorb certain wavelengths of visible light. Let’s use a green leaf as an example. 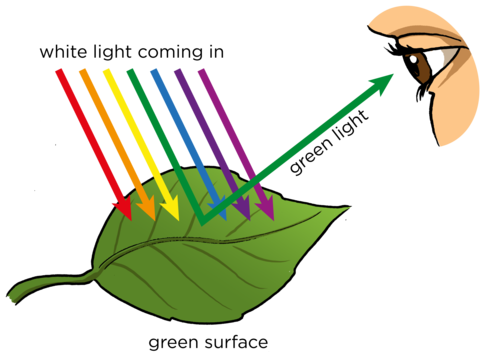 A green leaf looks green because all the other colors in light (Red, Orange, Yellow, Blue, Indigo and Violet) are absorbed by the leaf except the green, which is reflected off and picked-up by our eyes. Other molecules like anthocyanins, which are found in fruits including cherries and cranberries, contribute to red and purple colors (in these cases, red and purple light is reflected). What’s more, emerging research is beginning to look at the role of these powerful pigments in human health. So, after that mini science lesson, let’s dig into how we can celebrate the Fourth while eating our way through reds, whites and blues that are good for you, too! Begin your day full of celebration! You might be on your way out the door to your first event before you can even sing the Star-Spangled Banner. Try making these easy Maple Cranberry Corn Muffins the night before the Fourth, so you and your family can grab and go the next morning. Swap the typical mayo for vinegar, lemon juice, mustard and fresh herbs in this different take on potato salad. It’ll be a hit no matter where you go. While this dish is best served immediately, you can store it in refrigerator until serving. Red, White and Blue – Oh My! End the day with a sweet surprise. No matter if you’re hosting the festivities or a guest, preparing these Mini Fruit Cocktail Trifles will be sure to please everyone. While this recipe calls for amaretto, make it kid-friendly by substituting in 1/2 cup milk and 1 teaspoon of almond extract.